Original, abstract, fluid acrylic on stretched canvas. The resin finish highlights the details of the painting. Liquitex pouring medium, floetrol, acrylic paint and silicone were used to create this one-of-a-kind piece. The colors used are navy, teal, mint green, and white. 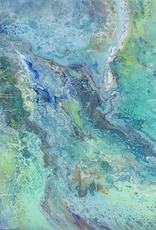 The high-quality resin used to complete the painting was ArtResin. Handmade Item, Fluid acrylic pour, Sealed with ArtResin, Each painting is unique and one-of-a-kind This painting has been sealed with two coats of ArtResin. To clean, use a slightly damp microfiber cloth.